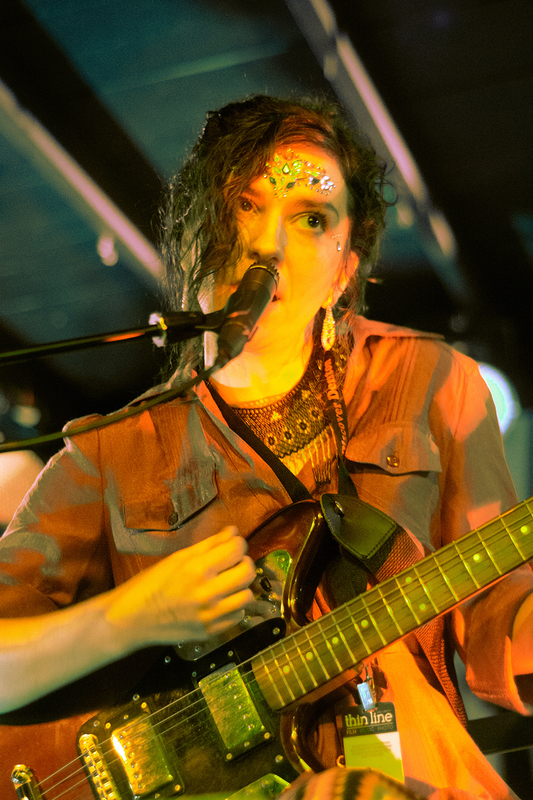 Oak Cliff-based rock band The Bralettes and the new lineup of the Austin synth-pop band Technicolor Hearts graced the stage at the recently reopened Rubber Gloves venue for Thin Line Fest. Each band has three members but both trios manage to pack a punch that pulls their audiences in. Technicolor Hearts’ vocalist Merri Palmer sings on stage during the band’s set on Friday at Rubber Gloves. Image by: Ashley Gallegos. The original version of this “art pop” group played its first show on Nov. 11, 2011. Founding member and multi-instrumentalist Joseph Salazar recently joined forces with bassist Carter Greeves and singer Merri Palmer to breathe new life into the band. Though their Friday night performance at Rubber Gloves was their fourth show together, they played with the chemistry of a seasoned band, which could be attributed to the fact that they have been friends for some time. Palmer said being a member of the band after having been a big fan is intense and exciting. Palmer and Salazar performed with colorful jewels on their faces, physical representations of the band’s new direction. Salazar has played in numerous bands over the years and Palmer is a part of another band, Color Candy, which plays Elliot Smith-inspired ’90s rock. Greeves said he was a late bloomer when it came to music. Now, it is a large part of his life, since he works as a sound engineer and producer and plays in Technicolor Hearts. The Bralettes drummer Andy Cantu plays at the band’s show at Rubber Gloves on Saturday as part of Thin Line Fest. Image by: Ashley Gallegos. 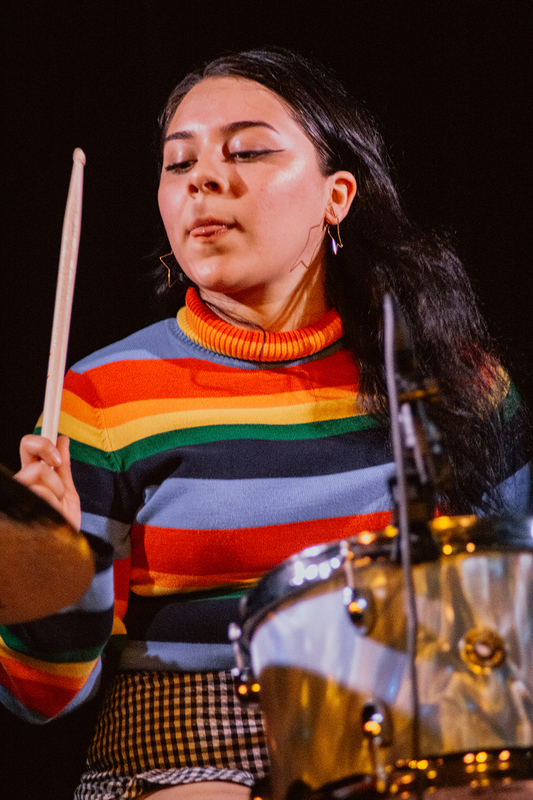 Vocalist Paulina Costilla, bassist Molly Hernandez and drummer Andy Cantu call their band a family affair. Costilla’s brother is Hernandez’s boyfriend, and Costilla and Cantu have known each other since middle school. Costilla said it was difficult for her to sing in front of crowds of strangers at first because she said she is naturally shy. Cantu said she endured the same initial stage fright but after a few performances, she said she began to wonder why she was ever afraid. Hernandez said with The Bralettes, being an all-female band can invite people to judge them even more. Hernandez said being in The Bralettes has been a creative outlet and served as a way to express herself. While the trio said they are still working on being comfortable on stage, interacting with people in the audience helps them embrace the moment and have fun while performing. 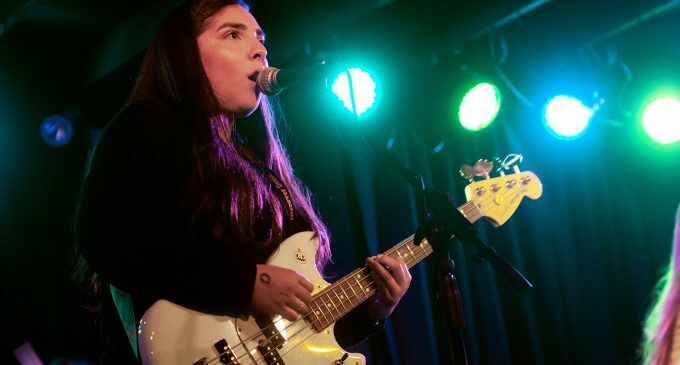 Featured Image: Bassist Molly Hernandez of The Bralettes sings at the band’s show at Rubber Gloves on Saturday. Like the other members of the band, Hernandez lives in Oak Cliff. Image by: Ashley Gallegos.